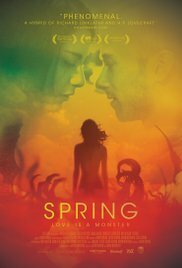 “Spring” isn’t really a horror film. It’s a rather mythological love story with a “not so bad” twist. A story about how true love can overcome obstacles and how that makes you choose irreversible options. And this interspersed with sometimes lurid and bizarre scenes. There are several moments in this film, which also proceeds painfully slow (the only flaw I could think of), where you are wondering what the hell is actually going on. And when everything is explained in detail, you frown and instantly you think “What the f * ck was that ?“. I admit that the whole metabolic explanation went over my head the first time, but after a while it became really clear and I realized it was dead simple. Ultimately it was a film that took me by surprise, despite its long playing time, and unexpectedly continued to fascinate me. The beginning of this remarkable film is I could say brilliant. A scarce setting. Young Evan (Lou Taylor Pucci) at the bedside of his dying mother. A joke. A blank stare. A final sigh and then … finito. The day of the funeral ends with an out of control bar fight. To avoid problems with the local police, Evan decides out-of-the-blue to book a plane ticket and travels to distant Italy. Once there, he ends up in the company of two British loudmouths whose main interests are : pouring as much as possible alcohol in their throat, using gore language and constantly trying to seduce an Italian girl. The day they scram and leave Evan behind, he’s determined to get acquainted with the beautiful Louise (Nadia Hilker) with whom he briefly made eye contact, somewhere at a village square. He offers his services at some farm in order to pay for his stay and slowly the two grow closer together. What emerges is a not so obvious relationship. The mysterious and impulsive Louise isn’t exactly making it easy for Evan and soon the viewer is fully aware that she’s hiding a terrible secret. What is it that makes this film so unique? Several things as I look at it afterwards. The casual and spontaneous way these two people interact, converse and let love flourish between each other. Not with contrived and forced dialogues. It seemed as if their love game unfolds naturally before your eyes and you witness how two charismatic individuals whirl around each other in a flirting way. You wouldn’t say that Evan has charisma. He looks more like a meaningless, unqualified,miserable fellow who has no specific goal in his life and also has a limited wardrobe. Yet he came across as profound and intellectual during philosophical conversations with Louise. And certainly the speed at which he could grasp the whole explanation, proves there’s a sparkle of some intelligence. Conversely Louise is a chunk of charisma. A mysterious character who Evan can’t get hold of and whose reasoning and reactions raises questions. The reason why she is confusing at times and stands aloof, becomes clearer as soon as the terrible secret is revealed. Superb performances without a doubt. Also cinematically it’s a bit different. The camera movements and positions are sometimes surprising. The bird’s-eye view sometimes delivers beautiful images such as the boat trip. These splendor images are regularly interrupted by short shots of all kinds of flora and fauna. Bizarre and sometimes incomprehensible. But all this is ultimately connected with the big secret. The most successful scene is when Louise explains the whole mystery to Evan. Although she doesn’t want to explain it initially, she changes her mind and she does it while Evan is on its way through the narrow streets of the Italian village. And while stumbling over the cobbles he listens to the eerie tale. I would have preferred that she’d tell this complicated story calmly at a table because the pivoting camera and flashy long sequence demanded all my attention. And this ensured that the final message didn’t directly hit me and sounded pretty hazy. The horror clips are scarce, sometimes unclear and sometimes with pretty ugly CGI. Is this done deliberately? Were the resources limited? I have no idea. But ultimately it all fits perfectly with the rest. Maybe there’s a moment when you’re wondering where exactly the romance is hiding ? Maybe you dropped off because it’s pretty surreal and it all looks strange. And yet you should do the effort to sit through the movie, because the final denouement is pure romance. This is the epitome of true love. Maybe I raved about this film, but I’ve never seen the concepts life, love, death,pregnancy and rebirth flow into each other in such a subtle way. A simplistic love story with a quirky twist which eventually ends in a way you hoped it would end. A beautiful, unique film that briefly will resonate to some.